Okay, Folks, I may have listings up on eBay, I list dolls, doll clothes and doll furniture, and some other stuff!! ...include trunks, bath items, a spoon, and DyDee Doll Clothing and Accessories, Clothes and accessories of course! Dy-Dees were available with chests, clothing, bath items, a bottle, a hot water bottle, a spoon, a diary, a book called "D-Dee Doll's Days," her own diaper bag, bubble bath, a pacifier and a bubble pipe to blow...yes, wet bubbles! 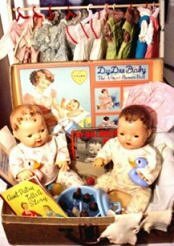 DyDee doll clothing was available in layettes...suitcases and trunks. One of my favorite Dy-Dee accessories is the flannel one piece drop seat pajama with Dy-Dee imprinted overall. There are also paper dolls which can be displayed with Dy-Dee. These were by Queen Holden. 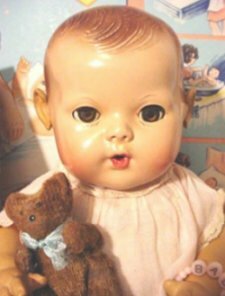 eBay has a rather large set of listings of vintage Dy Dee dolls for sale, and if you are interested in a purchase, or to find values if looking for costs, it is necessary to register with eBay. One of the reasons I find Dy-Dee dolls so appealing is the search and acquisition of missing articles to complete layettes. And of course, the addition of a few extra items of interest only make them more displayable. 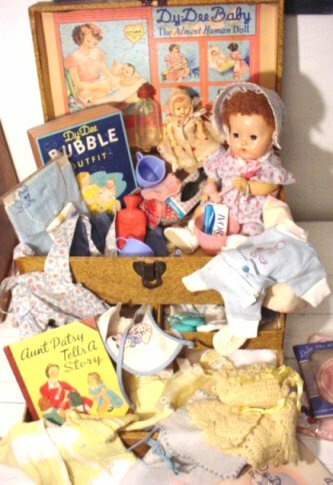 You can purchase clothes and many of the DyDee Doll Clothing and accessories that originally were sold in Dy-Dee layettes as well as small vintage dolls and toys, that display well with the babies. 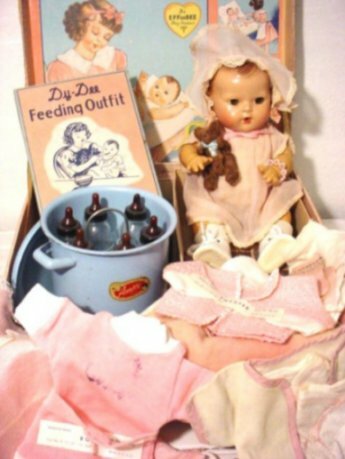 "Aunt Patsy" became the caretaker of Dy-Dee dolls, and a booklet "What Every Young Doll Mother Should Know" was included in DyDee doll clothing layettes. There are several Dy-Dee versions, Dy-Dee Kin, Dy-Dee Ann, Dy-Dee Lou, Dy-Dee Wee and in the 1940's Dy-Dee Louise, Dy-Dee Jane and Dy-Dee Ellen. Whoops, almost forgot the range in size. A 9" which I have not often seen, and 11, 15, and the very heavy 20". The sweet baby that tweaked my heart is pictured to the below. An 11" with applied rubber ears, she is probably Dy-Dee Ellen. Would you look at those ears! She is just irresistible! Dy-Dee bodies are well marked. From the shoulder to mid-back in fact. Very lengthy markings.